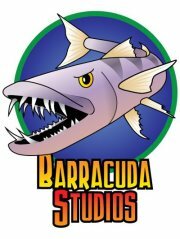 Barracuda Studios Enters the Great War! 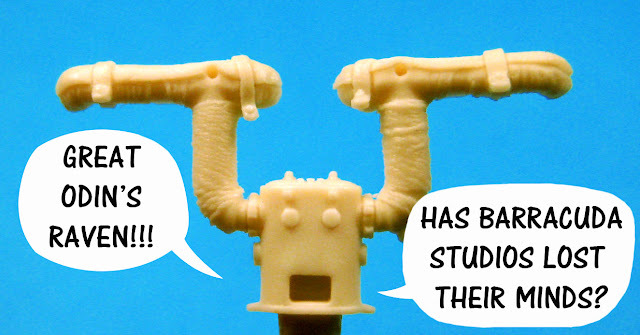 The modelling public is gob-smacked by our new direction, but fear not, we have not turned our back on WWII subjects. Wing Nut Wings turned the modelling world on its head a few years ago with the launch of a growing line of absolutely heart-stoppingly beautiful kits of World War One aircraft in 1/32nd scale. They are not only state of the art, but they have set new standards for quality, detail and accuracy. 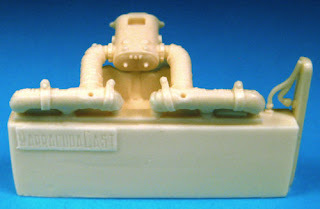 This super-detailed resin exhaust manifold directly replaces the kit exhaust manifold in the gorgeous1/32nd scale WNW Pfalz. D.XII. Once removed from its casting block; it directly replaces the kit part. It has been upgraded with the addition of weld beading at the junction of its component parts, and the opening has been deeply hollowed out for a more scale appearance. A very quick and easy upgrade to your late production Pfalz model. This simple two part resin upgrade set replaces the kit intake manifolds for the following kits: Roland D.IVa, Pfalz D.III, Pfalz D.IIIa, Albatros D.V and D.Va, Pfalz D.XII, Fokker D.VII. The parts are designed specifically for the above listed WNW kits in 1/32nd scale, but will work with Roden and others with a small amount of modification. The manifold has been detailed to include the asbestos cord insulation wrapped around the intake pipes. The sheet metal shielding has also been modelled and the mounting clamps are petitely reproduced. Castellated couplings, and additional details round out this simple upgrade. Once removed from its casting block, it is a drop fit for the original kit part. A quick and easy upgrade that will add a lot of detail to the already beautiful engine in these amazing kits. We are accepting orders now, and will begin shipping by Wednesday. More resin is likely for this series of kits, depending, of course, on the popularity of these sets. The onslaught of resin will continue shortly, with a number of releases in 1/48th scale, and more resin for the Tamiya P-51D Mustang including FOUR sets of new resin tires with different tread patterns. For those of you that remember the old Cooper Details days, relax. We have not forsaken our first love. There are a number of 1/72nd scale sets in the pipeline. The next few months are going to see a definite upturn in the release of new resin for all scales. Better get back to the workbench. This stuff ain't gonna do itself.... although it would be great if it did! 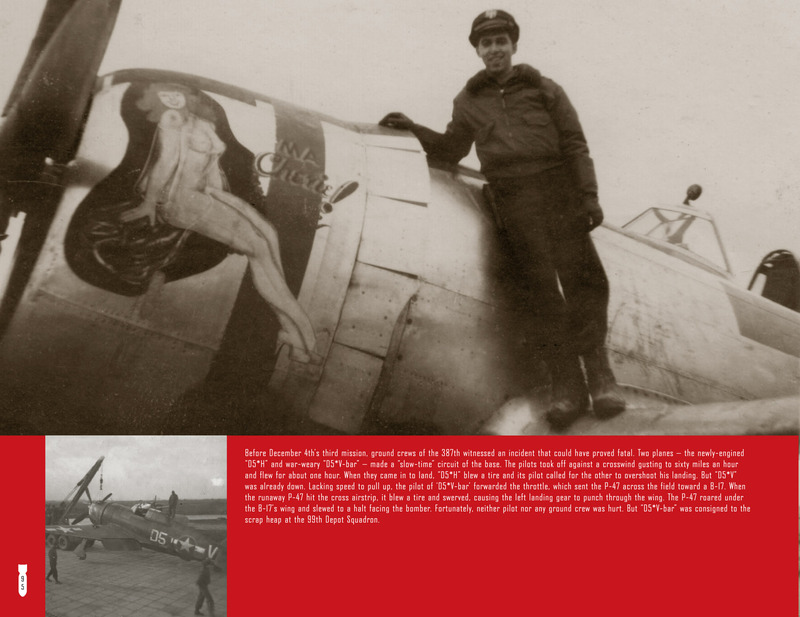 Large, well printed photos, like this one of Lt. Robert Thoman posing proudly on his P-47D-22 "Ma Cherie", most never published before fill the pages of this book. Interesting sidebars, like this one about a landing mishap, add human interest and a sense of being there. Wow!!! What a book! I expected to see mostly photos of planes and pilots but didn't put it down until I had completely thumbed through the whole book. I read mostly the highlights so I could get to the next page. You guys have done a masterful job with the info supplied and I thank you for the time, energy and dedication to get this book to completion. I got the copy of the book yesterday, haven't hardly put it down! It is really great: the way it is put together is enticing; can't just read a page and put it down. And all the photos! My Gosh they're great! The book arrived yesterday, and what a book it is. FANTASTIC is a gross understatement, but my vocabulary is limited. I'm truly Honoured to see ELSIE at the beginning of the book. THANK YOU. Here are three more of the 98 colour profiles found in this book. Don Barnes spent hundreds of hours pouring over photos, trying to match up hundreds of shots of aircraft to put together the incredible 98 profiles, all complete down to serial numbers, codes, crew names and mission marks. All aircraft are also attributed to a pilot in the unit. “I consider the book an indispensable source for 365th FG Thunderbolt documentation"
I got your book today. All I can say is wow. It is very well done. I guess I am going to order a second copy to actually read and keep the signed copy for the future (not for sale). Thanks for putting out such a great reference. If you treat yourself to just one aircraft book this year make it "Thunderbolts of the Hell Hawks". I received my copy today and can tell you this book is a first class effort. Last year I read "Hell Hawks!" by Robert Door and Thomas Jones. A great book, highly recommended. But despite the well written text it left me wanting for more pictures of the men and machines known as The Hell Hawks. Roy's new book answers the mail! It is packed with photos of the pilots and their P-47s, artefacts, nose art, maps and best of all, beautiful colour plates of the Hell Hawks' P-47s. From a modeller’s standpoint, Roy's book fills in the blanks and answers all of the questions I had after reading Door and Jones' book. Roy, your book leaves me wanting for just one thing; DECALS. 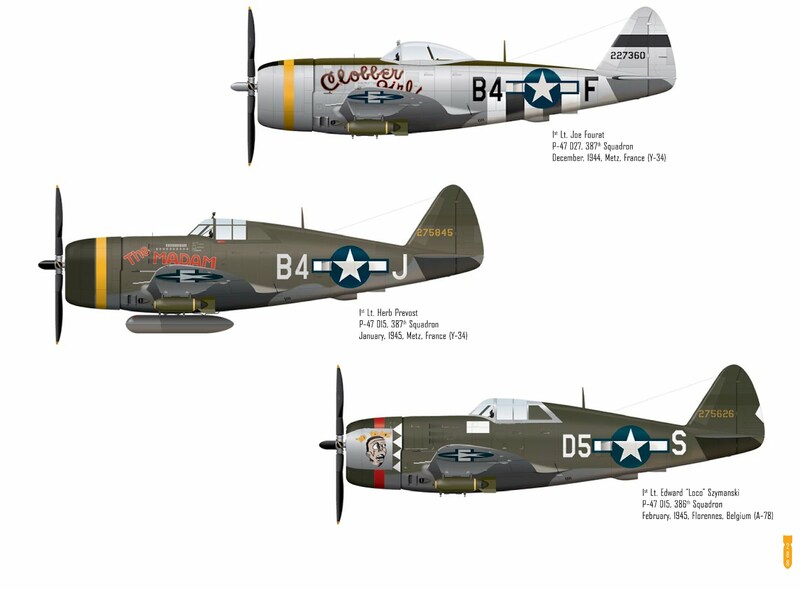 I have several P-47 kits set aside and waiting for Hell Hawks markings. I would love to add "Miss Dream Girl", "Ma Cherie", "Screemin' Weemie" and of course, "Turnip Termite" to my collection. How about it? Thanks for the kind words, guys! It's not really MY book. It's Don's passion and vision that made this happen. John and I helped, but none of this would ever have happened without Don's single minded drive to pay tribute to the men of the 365th FG. Don Barnes, John Crump and I are really thrilled that you find this book to be a worthwhile reference. Thanks also for keeping me from having to write more than a few sentences for this Blog entry!